As part of its exercise of leadership, the CMC will set up a new discipline inspection committee, which will send inspectors to the various departments and zone commands, Xi said. The anti-corruption campaign has moved more slowly through China’s military than through its civilian bureaucracy, as the PLA has its own body responsible for discipline violations. The new CMC discipline inspection committee will give Xi direct authority over the anti-corruption efforts in the military, as well as the ability to appoint hand-picked leaders who are serious about the task of weeding out corruption (see, for example, the immense impact the selection of Wang Qishan to head the Central Commission for Discipline Inspection has had on the anti-corruption drive). Xi also spoke of creating a new separation in “decision making, enforcement and supervision powers” in order to create a system of “checks and balances” in the military. At this time, it’s still unclear exactly what that system would look like; the Party in general has been strongly resistant to the idea of any checks on power. 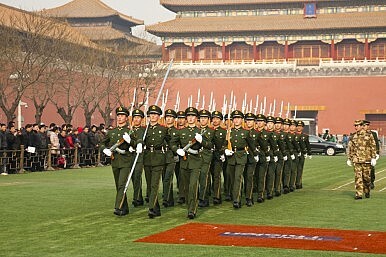 Finally, as previously announced, China will also cut its military forces by 300,000 troops, mostly focusing on administrative personnel. Xi also ordered the military to “resolutely terminate all paid services,” which will both trim the fat from PLA payrolls while also discouraging the corruption that often accompanies military-run business deals. This announcement has been a long time coming – military analysts inside and outside of China have long recommended a streamlined command system that allows for joint command and control. But the plan itself is just the first step in what will be a long and slow process. In making the announcement, Xi said the “breakthrough” should come by 2020, giving Beijing plenty of time to lay the groundwork. The reforms will doubtless face resistance from those who have a vested interest in the current system, but Xi is determined to carry through the restructuring – which will have important implications for China’s national security. “As the country progresses from a large country to a large and powerful one, defense and military development stands at a new and historic starting line,” Xi said. In order to truly modernize its military, China will need not just new technology, but a reorganized command structure that reflects how much China’s national security interests – not to mention warfare itself – have changed since the last round of major reforms in the 1980s. By 2020, Xi wants a military that is more nimble and flexible, able to respond to diverse threats around the world in a way the current military structure can’t accommodate.